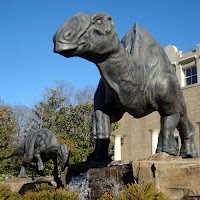 wanderlust ATLANTA: Fernbank Museum of Natural History: Dinosaurs! 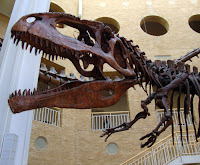 I have been to the Fernbank Museum of Natural History on many occasions, but never just to see the dinosaurs. That's what I did yesterday…and not surprisingly, I made some new discoveries. 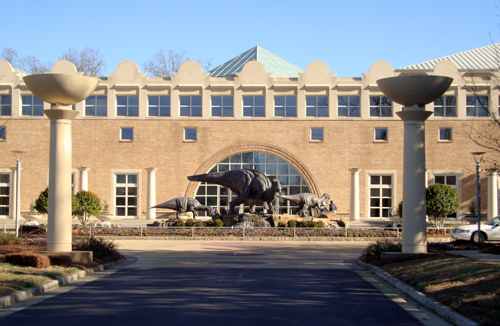 At first glance you might not think that Fernbank has a lot of dinosaurs, but don't be fooled. They're everywhere … and in some unexpected places. Every visit to the Fernbank Museum of Natural History is met with dinosaurs: at your greeting, in front of you, in back of you, inside, outside, overhead and underfoot, on the sidelines in hallways and featured prominently in galleries. Driving or walking into the Fernbank "estate" off of Clifton Road, you see a stately building flanked by columns kindred to those that would have been at ancient sacred sites (at least accordingly to Hollywood). Immediately in front of the building is a trio of dinosaurs ready to greet, not eat, visitors (they're herbivores, so no worries). This "welcoming committee" is a family of Lophorhothon atopus as they would have looked 65-144 million years ago right here in Georgia. The Lophorhothon atopus is of the Hadrosaurs lineage, also a duck-billed species. Poised on a rocky outcropping with waterfalls and a pond, the family beckons visitors to say "hello" on their way into the Museum. And you can learn more about the family's origins on the rail surrounding their habitat. 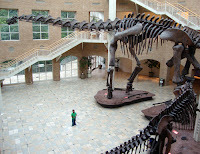 The Giants of the Mesozoic gallery in Fernbank's multi-story Great Hall is occupied by three very large dinosaurs. 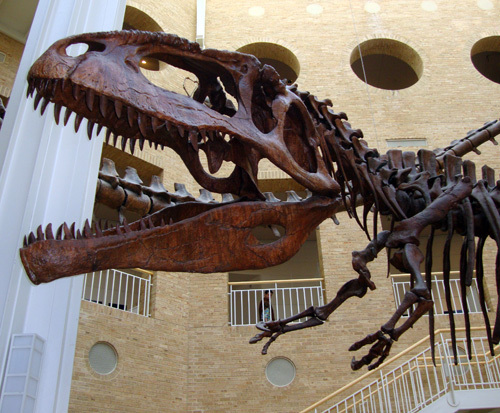 The largest in the collection also happens to be the largest dinosaur to ever walk the Earth…the Argentinosaurus. Also members of the trio are a Giganotosaurus, and a pterosaurs. 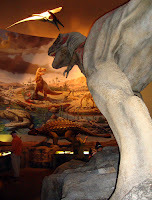 The three are from present-day Patagonia, Argentina, during the Late Cretaceous Period. 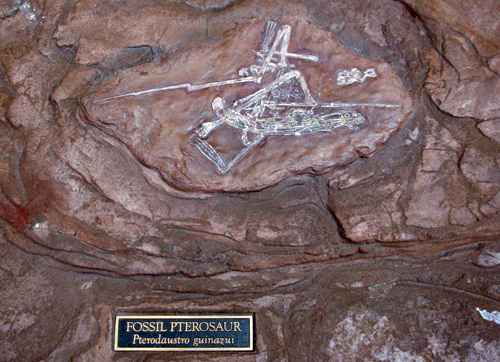 They are cast from the original fossil skeletons that still reside in Argentina as national treasures. Flying overhead is a flock of 21 Pterodaustro (featured in Jurassic Park III) and three Anhanguera. One of the surprises on this particular tour was the discovery of numerous fossils at the base of the Giants. To name a few, they include: a fossil turtle shell, a fossil frog, a fossil pterosaur, a fossil crocodile, and a fossil pine cone…the latter one being distinctly apropos given the large number of Georgia Pines in our locale. So, when you're checking out the giant dinosaurs, remember to look down from time to time. 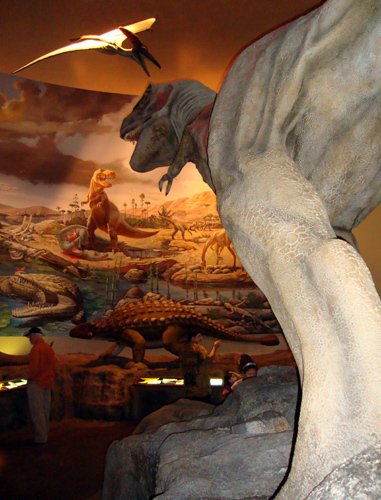 Another of Fernbank's permanent exhibits is home to several more dinosaurs and three very large dinosaur murals, A Walk Through Time in Georgia’s Ruling Dinosaurs gallery, one of 16 in this signature exhibition. In A Walk Through Time, visitors learn about Georgia's natural history through models, dioramas, and videos. A Tyrannosaurus Rex is the main star in the Ruling Dinosaurs gallery, but I'm particularly fond of the Pterodactyl. 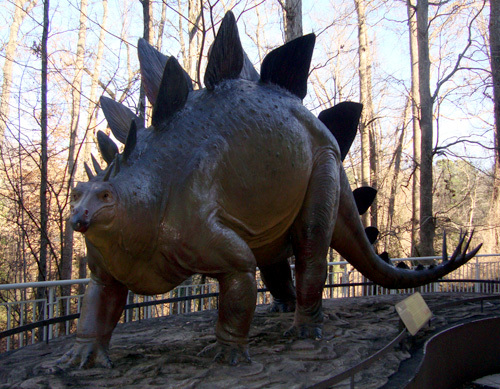 For a walnut-sized brain, the Stegosaurus is one of the most recognized dinosaurs from the Jurassic period. Of course, you have to find him to recognize him. The one at Fernbank can be found on the back patio (not unlike the occasional stray cat or raccoon you find on back patios here in the South). This particular Stegosaurus comes with a little notoriety, however. It's a replica of the Stegosaurus that was one of nine life-size models unveiled at the 1964-1965 World's Fair in New York City. Created by Louis Paul Jonas, of Jonas Studios, his work is considered ground-breaking for paleo-artists, even to this day. Also on the back patio are two dinosaur topiaries, one I believe is a T-Rex, but it's difficult to tell under all that foliage. 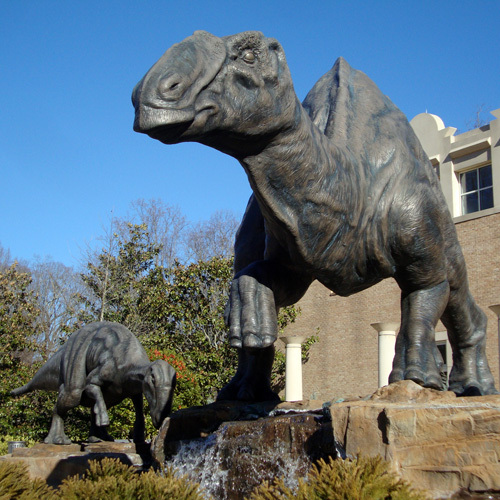 I think they may be used as props during special events (Fernbank is available for corporate and private events, such as weddings), otherwise they're on the patio to keep café patrons entertained. 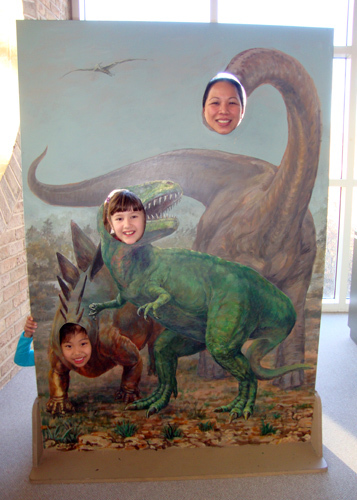 There are dinosaurs for everyone at Fernbank, including the two-dimensional, photo opportunity species. While exploring the Museum, I saw two County Fair-type boards with painted dinosaur scenes with holes for visitors’ heads for making photo memories. There's one with three holes and one with two. While passing one of them, I ran into a very lovely family that was having so much fun that I couldn't resist requesting that they allow me to include them in this post. I didn't get their names, but you can see on their faces their excitement of being around the Giants of the Mesozoic and other dino friends. Do I think I'll return to Fernbank anytime soon? I can hardly wait to see their new special exhibit, "Mythic Creatures: Dragons, Unicorns, and Mermaids." It opens Saturday, February 19, 2011, and I'll be there!